Richard Girolami (L.Ac. RYT) has been studying and working on the human body for more than 20 years, training in many forms of movement, sport, meditation and bodywork. After receiving his first degree from Arizona State University in kinesiology and wellness, he moved on to complete his Masters degree in Traditional Chinese Medicine. He travels frequently to New York and China for ongoing education with his respected teachers. 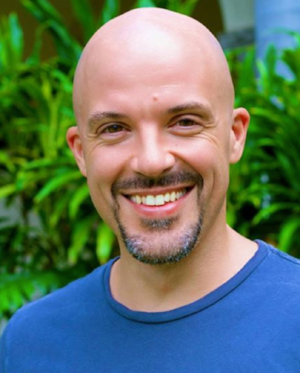 Living in Honolulu, Hawaii, he continues to enhance his treatment techniques, connecting deeply with elements like movement, breath, aromatherapy, myo-fascial and cranio-sacral bodywork. He is grateful to travel and work with all types of clientele as well as share and learn from masters in other styles of healing and martial arts. Over the past 10 years, he has combined his diverse experience working with the human body into Five Senses Therapy Intuitive Bodywork, which uses several complementary modalities to help people create balance and move towards optimum health. Richard follows a simple philosophy with his work. All healing begins with a shift. This shift can be physical, emotional, energetic - a shift in understanding or in perspective. Meeting people where they are in the present moment, developing trust, moving to a new place together. His techniques combined with his intuitive interactive approach empowers clients to break old patterns creating new opportunities for the body to heal itself. Practitioner and client work together to make significant change. Richard Girolami is the founder and CEO of Silk Bridge LLC. His vision began with the desire for more expert knowledge sharing and events both in Hawaii and worldwide. The mission of Silk Bridge LLC is to seek out amazing individuals and facilitate their sharing of expertise with other like-minded knowledge seekers through lectures, workshops, events and one-on-one meetings. Our bodies are a product of our lives. Every thought, food, movement, emotion and injury you have ever had has brought you and your body to this exact point today. At one time in our lives we were free to move without restriction or pain and our body’s alignment was supportive of our adventures. Over time, most of us have some stress, pain, restriction, misalignment and imbalances that develop. Intuitive Bodywork uses various techniques to make a shift in the body. Richard works together with his clients to locate, understand and release tight and injured areas, bringing the body back into alignment. His experience as well as his background in TCM allow him to offer some deeper constitutional feedback and assist in creating both energetic and physical changes. Richard’s techniques range from deep to subtle and are commonly accompanied by useful information and a new physical understanding in the body. His clients have seen positive results for pain, stress, anxiety, old injuries, postural issues, mobility, post surgery and improved athletic performance. Refresh, realign and take a short journey towards a healthier more optimal you.